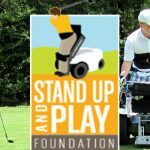 Stand Up and Play Foundation Family, friends, and fans – Thank you so much for taking the time to view our fundraiser page. The Stand Up and Play Foundation was formed to help wheelchair users and other people with impaired mobility have the opportunity to stand up and participate in sporting, artistic and other daily events. Any support is greatly appreciated.